When you set indentation for a paragraph, its left and/or right sides are inset by the amount you specify. A first-line indent (clever name) occurs when the first line is indented more than the rest of the paragraph. You’re probably familiar with first-line indents from reading novels or reports. To help the reader’s eye catch the beginning of a paragraph, most long documents use either a first-line indent or extra vertical space between paragraphs (not both). A hanging indent occurs when the first line is indented less than the rest of the paragraph. Hanging indents are typically used to create listings. In a bulleted or numbered list, the bullet or number hangs off the left edge of the paragraph in a hanging indent. 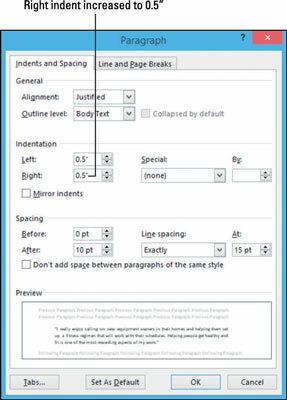 However, in Word, when you create bulleted or numbered lists, Word adjusts the paragraph’s hanging indent automatically, so you don’t have to think about it. The Decrease Indent and Increase Indent buttons on the Home tab: The Home tab offers a quick and easy way to indent a paragraph along the left margin. The Paragraph dialog box: Here, you can apply first-line or hanging indents and set precise amounts of indentation for the left or right margins. In a document, triple-click a paragraph containing a quotation to select it (In the example the paragraph that begins with “I really enjoy . . .”). The left indent increases by 0.5 inch. Click the dialog box launcher in the Paragraph group to open the Paragraph dialog box. Click the up arrow on the Right text box to increase the right indent to 0.5 inch and then click OK. The paragraph is indented 0.5 inch on each side. Click in another paragraph. In this example the paragraph that begins “Our sales . . .” and then click the dialog box launcher again to reopen the Paragraph dialog box. From the Special drop-down list, choose First Line. A first-line indent default value of 0.5 inch appears. That paragraph is now first-line indented by 0.5 inch. For more practice, try setting a hanging indent for one of the remaining paragraphs. Choose Hanging from the Special drop-down list in the Paragraph dialog box. When you’re finished, press Ctrl+Z to undo. Leave Word open for the next exercise. 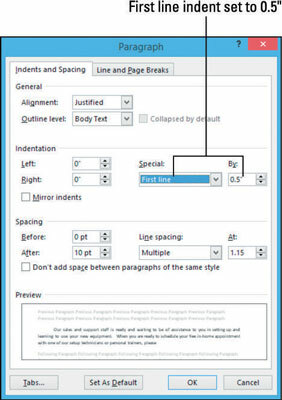 If the Ruler is displayed in Word, you can see indent markers on it showing where the current paragraph is indented. Choose View→Ruler to toggle the Ruler on or off. If no indents are applied, the indent markers coincide with the margins. The margins are represented on the Ruler by the areas where the Ruler’s color changes from dark gray to light gray. Down-pointing triangle at the left: First-line indent. Drag this triangle to adjust the indent of the first line only. Up-pointing triangle at the left: Subsequent-lines indent. Drag this triangle to adjust the indent of all lines except the first one. Rectangle at the left: Left indent. Drag this rectangle to adjust the overall left indent for the paragraph. If the triangles at the left are not both at the same position, dragging the rectangle will adjust the left indent proportionally, keeping the current relationship between the two. Up-pointing triangle at the right: Right indent. Drag this triangle to adjust the right indent. You can’t adjust the right indent for different lines in the same paragraph separately. The following shows the indent markers on the Ruler for a paragraph that’s indented 1 inch at both left and right margins and the first line is indented an additional 0.5 inch. 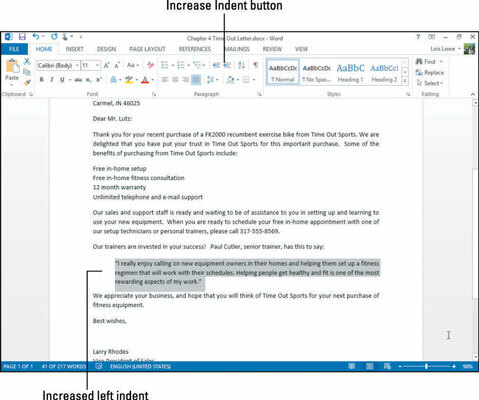 In your document, click in a paragraph. In this example, a quotation paragraph. The indent markers for that paragraph appear on the Ruler. If the Ruler doesn’t appear, select the Ruler check box on the View tab. Drag the left indent marker (the rectangle at the left) to the 1″ mark on the Ruler. Be careful that you drag the rectangle, not one of the triangles. Drag the right indent marker (the triangle at the right) to the 5.5″ mark on the Ruler. Note that the two triangles on the left end of the Ruler are not aligned with one another; the first-line indent is set at 0.5″. Drag the first-line indent (the upper triangle) to the left margin (0″ on the Ruler). The first-line indent is removed from the paragraph.